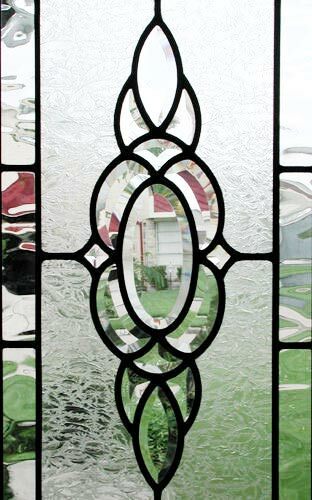 "HG12V" LEADED GLASS VERTICAL BEVEL SIDELIGHT WINDOW CUSTOM AT GLASS BY DESIGN. 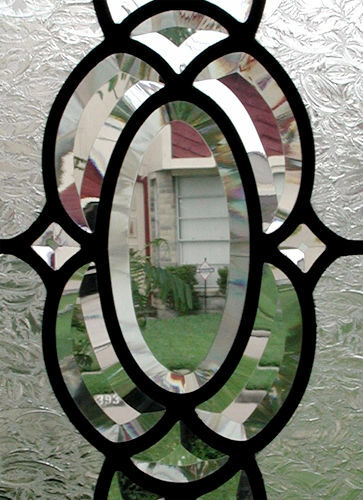 This custom leaded glass bevel sidelight window was 13" x 48". The HG12 "bevel set" is 6 ¾" x 18 ¾". This leaded glass sidelight window had gluechip glass in the background and a Waterglass border. These are all clear textured and/or beveled glasses. Any color you see is what the camera saw through these glasses.